While Magento offers a lot of power when you want to customize category pages and their impressions on your users, there are still some options that are not provided but would come in handy. One common desire is to promote expensive products and ability to reverse sort direction of products in category is a simple way to achieve that. Prerequisites: Magento module creation, setup scripts, block rewrites. 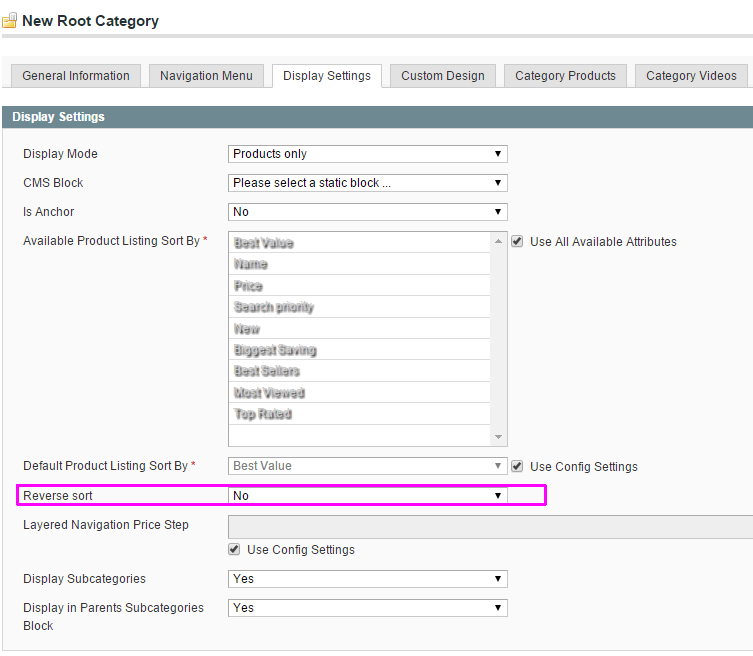 Which will add attribute that can be changed in magento admin interface, under Catalog -> Manage Categories, on tab “Display settings”. Second step is rewriting toolbar block used on category page. It controls by which criteria we sort products in listing (reacts to user changing “Sort By” in frontend or clicking direction change arrows “ASC/DESC”). We are going to extend that functionality and make it react also to reverse_sort attribute we just made, if it is set to “Yes“. In your config.xml, inside <frontend> or <global> node, declare block rewrite so Magento knows we are doing something funky with product_list_toolbar block.